On November 11, 2008, at the age of 89, Quincy Montz presented the parish of St. John the Baptist with a memorial to all parish World War II veterans. The memorial was the culmination of Quincy’s years of painstaking research and tireless dedication. And underscoring his steadfast commitment to this project, the memorial was funded entirely through the sales of four books written and published by Mr. Montz. The inspiration for Quincy’s tribute was a 1999 speech given by First Lady Hillary Clinton, urging all citizens to help save America’s treasures. Eager to support the country he so dearly loves, Quincy decided that his contribution would be to preserve the history of St. John the Baptist parish, his home since birth. Realizing the parish lacked a tribute to all parish residents who served in WWII, Quincy found his opportunity. 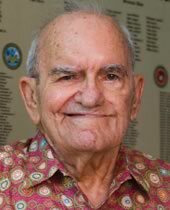 A WWII veteran, Quincy Montz insisted on creating a memorial to recognize each of the 1,758 WWII veterans from the parish. To track down all of their names, Quincy pored through official documents, searched the internet and made countless phone calls around the world until he included every single veteran. Quincy’s success is a tribute to these fine men and women as well as his passion for our country. When challenged to save America’s treasures, a younger man would likely think of buildings or bridges. But decades of experience have taught Quincy that America’s greatest treasure is her people. Buildings may come and go but the history of the people who lived and worked in those buildings is what really matters. Who knows this better than Quincy, whose hometown of Lions was sacrificed for industrial growth and jobs? But Lions will not be forgotten… because like the fallen veterans of WWII, Quincy Montz cared enough to tell the story. Quincy Montz… Peoples Health Champion.